Have you ever seen a farmer so excited to find a thistle? When they’re looking for pollinator-friendly plants, the bigger the field thistle, the better. Andy admitted that in the past he would have pulled all of those thistles out. Now he leaves them… but, he did remove about 1,000 in the pasture, and left about 500. “They do tend to spread prolifically, and I thought 500 was enough for that pasture,” he said. Sarah Foltz Jordan, pollinator conservation specialist with The Xerces Society, shows attendees a hollow stem, about the size used by cavity-nesting sulfur bees. The asparagus at Grinnell Heritage Farm has been managed organically since 2007, and still yielding well. The Dunhams seed soybeans after they harvest the asparagus for weed control. Andy used to plant the soybeans into the asparagus with a broadcast spreader, but now uses a 15-ft no-till drill. After the last harvest, he flail mows the asparagus bed, then does a light tillage pass and plants the soybeans. 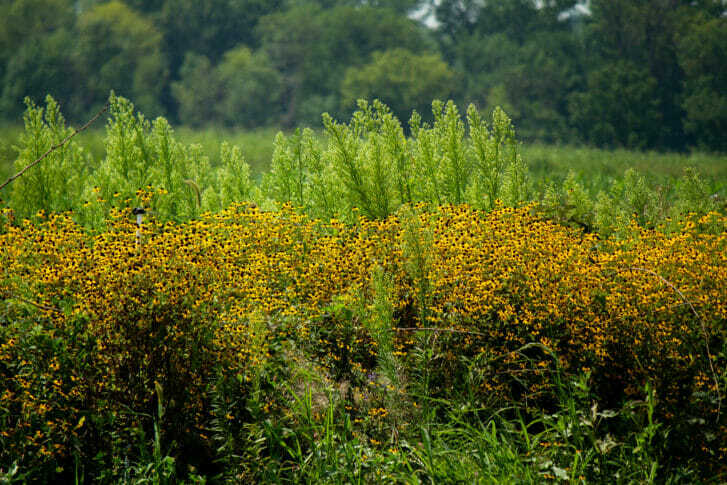 As he walked along a pollinator bed among his vegetable beds, Andy identified shrubby St. John’s wort, pasture rose (not multi-flora rose), rose hips, prairie clover, mountain mint, prairie onion, blazing star, hyssop, blue false indigo, butterfly milkweed and various asters. Sarah noted the excellent bloom succession in the pollinator planting, which is particularly important for bumble bees. Directly in front of the group in the photo below is a beetle bank, then the fronds of flowering asparagus, and the row of shrubs along the road peeks out at the top. “The first shrub row I planted, I alternated tree species with each plant. For this newer shrub row, I followed the advice of the Xerces Society, doing cluster planting so the pollinators can find them more effectively.” In the photos below, Andy planted the shrubs in clusters of 15-20 plants, then switched to a different species, which include redosier dogwood, silky dogwood, gray dogwood, ninebark and wild plum. Below, shrubs along the row are planted in clusters, by species. Gray dogwood, with its characteristic red stem. Wild plums were in season during the field day, providing a quick snack (below). Andy noted that because of the wild plums, the farm is now also home to wild turkeys. “Many of our native shrubs also provide edible fruit,” added Sarah. These include: wild plum, aronia, black raspberry, juneberry, pin cherry, black cherry, choke cherry (a bunch of cherries), blueberry, currants, gooseberry, raspberry, service berry, blackberry, dew berry, and many others. 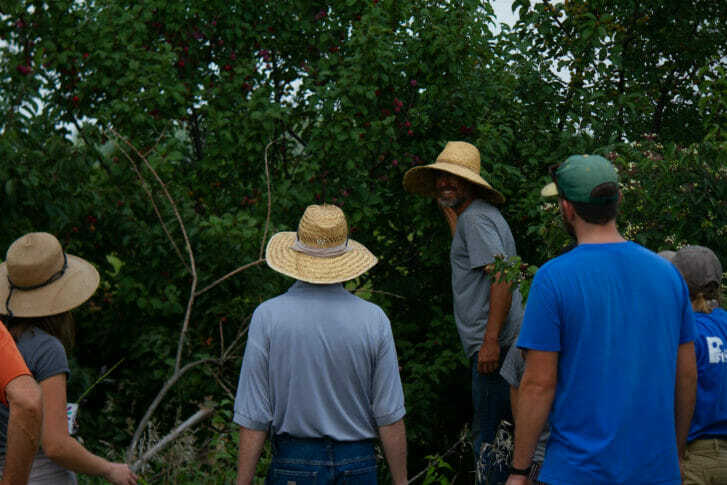 In addition to the two shrub rows the group saw on the tour, Grinnell Heritage Farm has surrounded their property with more shrubs and hardwood trees, including: hazelnut, aronia, burr oak, red oak, Kentucky coffee tree, black cherry, shagbark hickory. A lot of wildflowers have now moved into those areas. “This hay field was planted in the spring of 2007, as part of our entire farm’s organic transition. With approval from NRCS, this fall we are going to graze it to the ground, then no-till drill new species in to improve our yield on hay,” said Andy. A “bone yard” of Brussels sprout stalks provides excellent habitat for insects. “I’m finding that my interest in farming, when we have more intentional habitat for beneficial insects, goes up. Looking around, we have some weeds; it’s been a challenging year, in that regard. But if it was just a scorched-earth method of farming… I don’t have any interest in doing that,” said Andy. 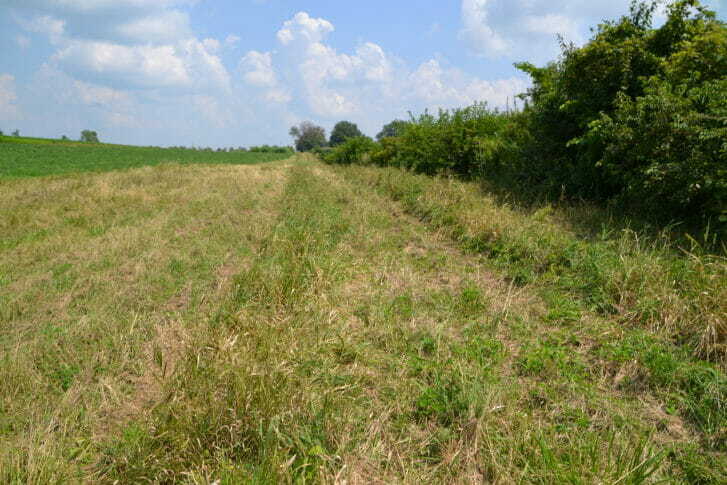 Andy suggested that a good rotation to add to a conventional corn and bean farm’s rotation would be to harvest a cereal rye for seed, bale the straw, then drill sorghum sudangrass and either graze, greenchop, or make hay out of it. It would fit with the corn and soybean production schedule. Additionally, sorghum sudangrass is a good nitrogen scavenger, and requires about half the water that corn does. Andy lets the sorghum sudangrass grow as long as weeds in it aren’t going to seed (if so, he float-mows waist high). He lets the sorghum sudangrass stand through the winter, which provides pheasant habitat. By spring the sorghum sudangrass has winter-killed, providing a thick mat over the field. He’ll add composted cow manure in the spring, and then plant an early June brassica crop. 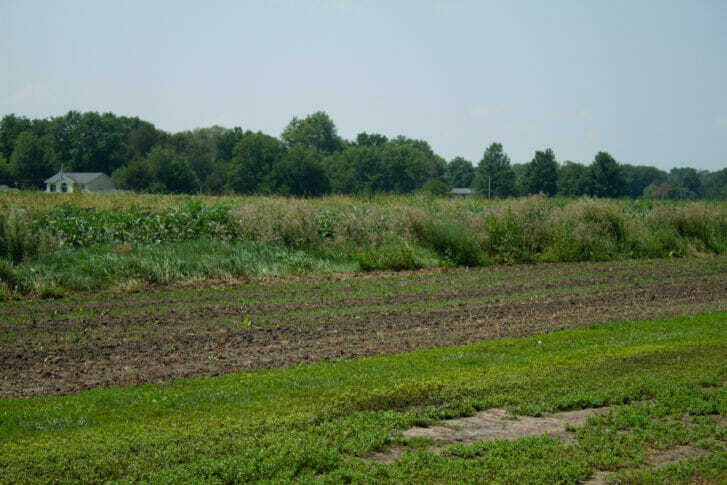 Andy typically follows carrots with Sorghum sudangrass, as the smothering cover crop also supresses root-knot nematodes, which are hosted in the aster family (which includes carrots). Sorghum sundangrass behind a worker weeding in a carrot field. 2018 was a particularly bad year for morning glory (field bindweed), which is thick on the stalks of this sorghum sudangrass. In the mowed strip below, Grinnell Heritage Farm and The Xerces Society collaborated to plant over 20 different species of flowering shrubs and some conifers in the fall of 2017 – which are all such small bare-root trees, they aren’t really visible unless you look closely for them. 2018 was a very dry year on Grinnell Heritage Farm, and without irrigation on this strip, Andy is expecting some loss on conifers. The strip is also mulched with wood chips. 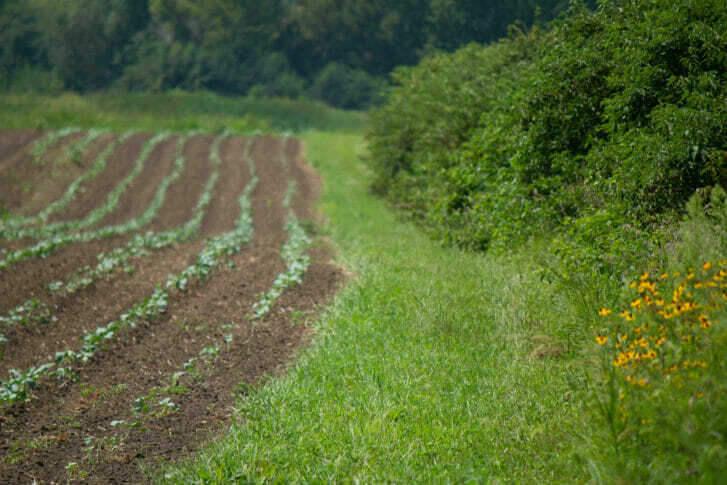 This 5-foot wide strip will provide even more spring blooms to the farm, and is in place better protected from insecticide drift than the other flower shrub row. 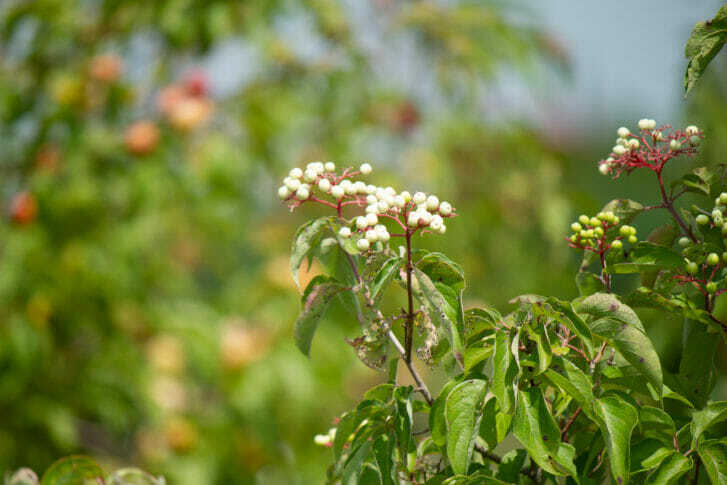 Andy noted that shrub rows on the periphery are easier to manage, but having the shrub row in the middle of the farm really elevates the presence of beneficial insects and birds. “Grandpa would be rolling over in his grave if he saw us planting shrubs in the middle of the cornfield,” he said. 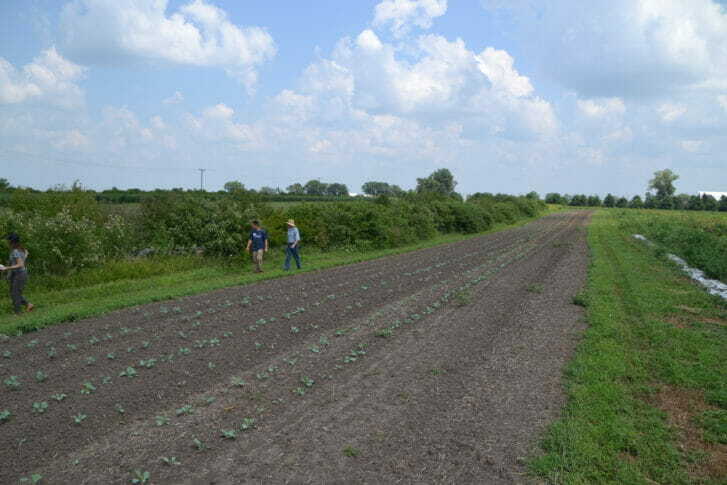 Grinnell Heritage Farm invests in these conservation practices to meet their long-term goals, which include making the farm enjoyable for visitors who come for pizza night and other events, supporting wildlife, and increasing the productivity of the farm. “How much we spend depends on the year we’ve had, and luckily we can do a lot of this cheaply using skills and equipment we already have,” said Andy. 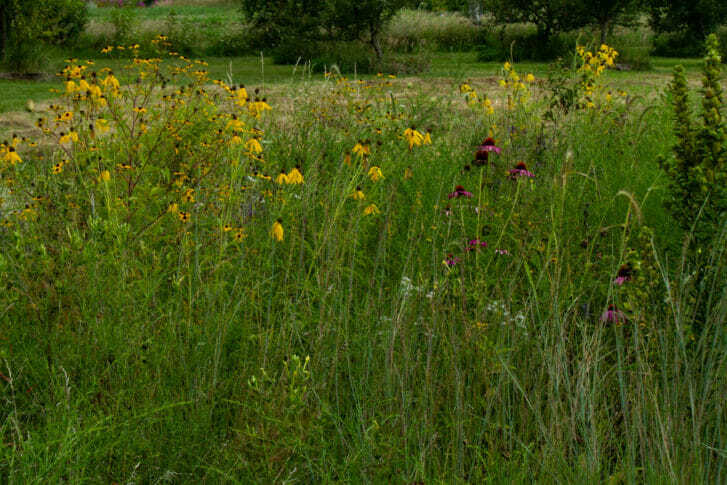 Grinnell Heritage Farm also has a number of pollinator gardens around the farm, which have many native forbs and grasses. Some of these are direct seeded, others are transplanted from the greenhouse or from Prairie Moon Nursery, or planted as cuttings of other plants, as possible. During the pizza night later that evening, dozens of kids took insect nets to these gardens and all the surrounding areas, adding an ecological element to their night on the farm. 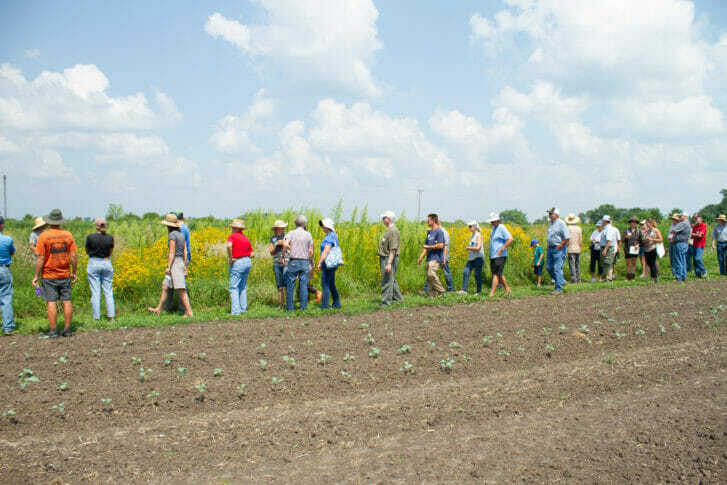 Following the tour of Grinnell Heritage Farm (and before the Pizza Night at the farm began), the group carpooled to Grinnell College’s Conard Environmental Research Area, for a brief tour led by CERA manager Elizabeth Hill. 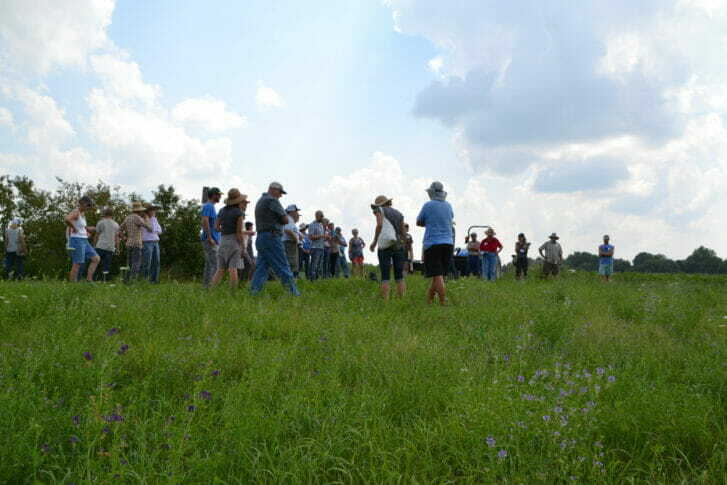 The 365-acre prairie and oak savannah is used for class field trips, student and faculty research, and quiet enjoyment by the public for birding, hiking, painting and drawing, and photography. 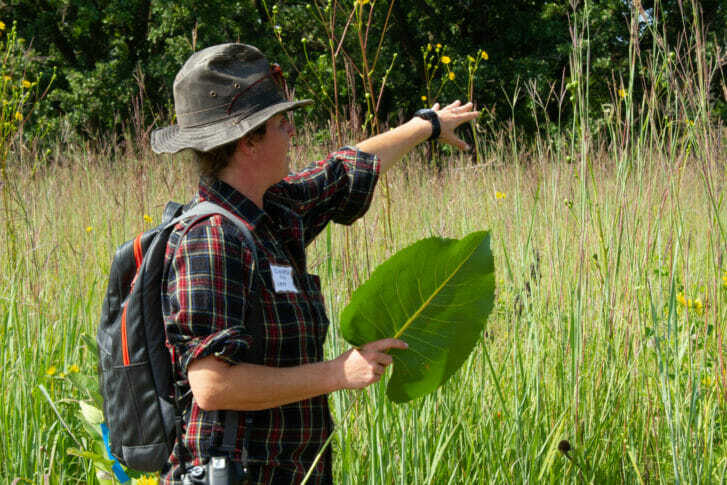 Below, Elizabeth Hill discusses student and faculty research about prairie management (holding a leaf of prairie dock). Support for this field and recent habitat projects at this farm were provided by an Iowa NRCS Conservation Innovation Grant. Additional sponsorship for this field day was provided by MOSA Certified Organic, Iowa Environmental Council, and Iowa Farmers Union. To hear directly from Andy, check out PFI’s promotional video for Grinnell Heritage Farm’s field day.